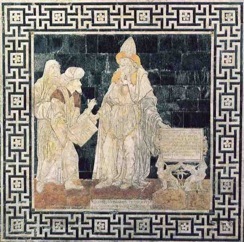 www.UfoQuest4Truth.com - album 53: The Ultimate Quest/ A Renaissance portrait of Hermes Trismegistus, from the floor of the cathedral at Siena, 1488; attributed to Giovanni di Maestro Stefano. The legend beneath the central figure reads, "Hermes Mercurius Trismegistus, the contemporary of Moses." A Renaissance portrait of Hermes Trismegistus, from the floor of the cathedral at Siena, 1488; attributed to Giovanni di Maestro Stefano. The legend beneath the central figure reads, "Hermes Mercurius Trismegistus, the contemporary of Moses." By the time his Egyptian followers came to establish their highly secretive communities, this Hermes underwent yet another modification, this time from the Jewish tradition. The presence of large numbers of Jews in Egypt in this period, many of whom were oriented toward Hellenistic thought, accounts for this additional element. In many of the Hermetic writings, Hermes appears less as an Egyptian or Greek god and more as a mysterious prophet of the kind one finds in Jewish prophetic literature, notably the Apocalypse of Baruch, 4 Esdras, and 2 Enoch. Still, when all is said and done, the Jewish element in the Hermetic writings is not very pronounced. The Hermes that concerns us is primarily Egyptian, to a lesser degree Greek, and to a very slight extent Jewish in character.Who, then, actually wrote the "books of Hermes," which, since their rediscovery in the fifteenth century, have played such a significant role in our culture? The writings are all anonymous: their mythic author is considered to be Hermes himself. The reasoning behind this pseudonymous approach is simple. Hermes is Wisdom, and thus anything written through the inspiration of true wisdom is in actuality written by Hermes. The human scribe does not matter; certainly his name is of no significance. Customs of this sort have not been uncommon in mystical literature. The Kabbalistic text known as the Zohar, currently believed to have been written in the medieval period, claims to be the work of Shimon bar Yohai, a rabbi of the second century A.D. Two of the best-known Christian mystical classics, The Cloud of Unknowing and Theologia Germanica, were written anonymously. The members of the Hermetic communities were people who, brought up in the immemorial Egyptian religious tradition, offered their own version of the religion of gnosis, which others propounded in a manner more appropriate to the psyches of other national backgrounds, notably Hebrew, Syrian, or Mesopotamian. Sir W.M.F. Petrie 3 presents us with a study of such Pagan monks and hermits who gathered together in the deserts of Egypt and other lands. He tells us of the monks' attention to cleanliness, their silence during meals, their seclusion and meditative piety. It would seem that the Hermeticists were recluses of this kind. Unlike the Gnostics, who were mostly living secular lives in cities, the Hermeticists followed a lifestyle similar to the kind Josephus attributes to the Essenes. When it came to beliefs, it is likely that the Hermeticists and Gnostics were close spiritual relatives. The two schools had a great deal in common, their principal difference being that the Hermeticists looked to the archetypal figure of Hermes as the embodiment of salvific teaching and initiation, while the Gnostics revered the more recent savior figure known as Jesus in a similar manner. Both groups were singularly devoted to gnosis, which they understood to be the experience of liberating interior knowledge; both looked upon embodiment as a limitation that led to unconsciousness, from which only gnosis can liberate the human spirit. Most of the Hermetic teachings closely correspond to fundamental ideas of the Gnostics. There were also some, mostly minor, divergences between the two, to which we shall refer later. Judging by their writings and by the repute they enjoyed among their contemporaries, the members of the Hermetic communities were inspired persons who firmly believed that they were in touch with the Source of all truth, the very embodiment of divine Wisdom himself. Indeed there are many passages in the Hermetic writings in which we can still perceive the vibrant inspiration, the exaltation of spirit, in the words whereby they attempt to describe the wonders disclosed to their mystic vision. Like the Gnostics, of whom Jung said that they worked with original, compelling images of the deep unconscious, the Hermeticists experienced powerful and extraordinary insights to which they tried to give expression in their writings. Intense feeling generated by personal spiritual experience pervades most of the Hermetic documents.